At United Egg Producers’ (UEP) annual board meeting and executive conference the organization celebrated four individuals who have made a lasting impact on the U.S. egg farming community. The annual conference marked the 50th anniversary of UEP’s work in representing the nation’s egg farmers. Egg industry leaders Linda Reickard of Eldridge, IA; Dr. Jeff Armstrong of San Luis Obispo, CA; Kurt Lausecker of Raymond, OH; and the late Gregg Clanton of Williamston, SC, were recognized at UEP’s awards dinner on October 18, 2018. Linda Reickard worked for UEP for over 35 years, serving in many roles including meeting planner, EGGPAC coordinator, accounts receivable and much more. She began working for the Midwest UEP region in May of 1977. In 1998, after the consolidation of the regional offices, Reickard continued to work for UEP from Eldridge, Iowa, until retiring in 2012. Reickard, known for her loyalty and kindness, was an invaluable employee and remains a member of the UEP family. In 1999, UEP asked Dr. Jeff Armstrong to establish an independent Scientific Advisory Committee for Animal Welfare. 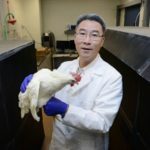 Dr. Armstrong, serving as the head of the Department of Animal Sciences at Purdue University, selected a committee comprised of distinguished animal scientists and veterinarians to create science-based guidelines for hen welfare. These guidelines served as the foundation for the UEP Certified animal welfare program which was established in 2002. Dr. Armstrong chaired the UEP Scientific Advisory Committee until 2011 and is currently the president of California Polytechnic State University. Kurt Lausecker moved to the United States from Germany in 1978 with his wife, Gertie, and established Daylay Egg Farm in Raymond, OH. He and his family currently own and operate Nature Pure, an organic egg farm, also in Raymond. He has been a friend, supporter and member of UEP for more than 35 years. Lausecker served in multiple leadership roles in the Midwest UEP region, including chairman from 1992 to 1993. In 1998, Lausecker chaired the UEP Long Range Planning Committee, which led to the much-needed consolidation of UEP regional offices to a headquarters location in Atlanta, GA. Longtime UEP member and industry leader Gregg Clanton received posthumously the organization’s highest honor: Egg Producer of the Year. Clanton had served on the board since 1997 before his passing in February 2018. During the 2015 Highly Pathogenic Avian Influenza crisis, he served as chairman for the Biosecurity Taskforce, which was formed to provide industry leadership and direction. Clanton became a member of UEP’s Executive Committee in 2015 and was slated to be an office holder, and eventually chairman before he became ill. Clanton’s wife, Anna, and daughters, Julia and Nicole, of Williamston, SC, received the award on his behalf. Dr. Larry Sadler joined the UEP team as Vice President of Animal Welfare in 2017 and works with egg farmers, customers and supply chain managers, and industry thought leaders to focus on continuous improvement and to find innovative solutions that advance the health and well-being of hens. UEP’s leadership in humane farm animal care began with the 2002 introduction of the UEP Certified program. One of the longest-tenured third-party certification programs in animal agriculture, the UEP Certified logo signifies hens that laid the eggs were raised under science-based animal well-being guidelines with compliance audited annually by third-party inspectors. UEP Certified guidelines include standards for hen housing, health and diets, plus employee training, strict biosecurity measures to protect food safety and hen health and an annual compliance audit conducted by independent third-party inspectors. Dr. Sadler has dual Bachelor of Science degrees in agriculture business and animal science from Iowa State University (ISU). While at ISU, he also received a master’s degree in animal physiology, with an emphasis in ethology and a doctorate in biomedical sciences. He held various positions in meat production and processing, before returning to ISU to secure his master’s and doctorate degrees in animal behavior and welfare. Raised on a cattle farm in northeast Iowa, where he still participates in the family business, Dr. Sadler also holds beef quality, pork quality and food safety certifications.